Constrictive pericarditis symptoms overlap those of diseases as diverse as myocardial infarction (MI), aortic dissection, pneumonia, influenza, and connective tissue disorders. This overlap can confuse the most skilled diagnostician. An increased suspicion of constriction helps move constrictive pericarditis to the top of a lengthy differential diagnosis list and facilitates correct diagnosis and timely therapy. The classic diagnostic conundrum associated with constrictive pericarditis is the difficulty distinguishing this condition from restrictive cardiomyopathy (see Restrictive Cardiomyopathy) and other syndromes associated with elevated right-sided pressure that all share similar symptoms, physical findings, and hemodynamics. Although obtaining a careful history and performing a physical examination remain the cornerstones of evaluation, technologic advances have facilitated diagnosis, particularly with the appropriate use of Doppler echocardiography, high-resolution computed tomography (CT), magnetic resonance imaging (MRI), and invasive hemodynamic measurement. Pericardiectomy is the predominant definitive treatment. Hemodynamic and symptomatic improvements are rapid. Medical management, such as careful observation or symptomatic treatment, has been suggested in less severe cases; however, this option is controversial. The underlying disease usually determines the prognosis. Poorer prognoses are associated with malignancy and New York Heart Association (NYHA) class III or IV heart failure symptoms. In constrictive pericarditis, the easily distensible, thin parietal and visceral pericardial linings become inflamed, thickened, and fused. Because of these changes, the potential space between the linings is obliterated, and the ventricle loses distensibility. Venous return to the heart becomes limited, and ventricular filling is reduced, with associated inability to maintain adequate preload. Filling pressures of the heart tend to become equal in both the ventricles and the atria. The preservation of myocardial function in early diastole aids in distinguishing constrictive pericarditis from restrictive cardiomyopathy. Systolic function is rarely affected until late in the course of the disease, presumably secondary to infiltrative processes that affect the myocardium, atrophy, or scarring or fibrosis of the myocardium from the overlying adjacent pericardial disease. 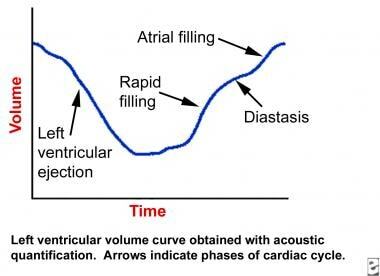 Experimental models indicated that a change in volume-elasticity curves (see the image below) was the fundamental pathophysiologic change associated with the disease. During development of the constriction, right and left ventricular diastolic pressure increased, and stroke volume decreased. A small increase in volume resulted in a considerable increase in end-diastolic pressure. Left ventricular volume curve in constrictive pericarditis. Symptoms consistent with congestive heart failure (CHF), especially right-sided heart failure, develop as a result of the inability of the heart to increase stroke volume. Over time, cardiac output gradually becomes inadequate (see the Cardiac Output calculator), at first with exercise and then at rest. The clinical symptoms and classic hemodynamic findings of constrictive pericarditis can be explained by the early rapid diastolic filling and elevation, with eventual equalization of the diastolic pressures in all of the cardiac chambers. This restricts late diastolic filling, leading to venous engorgement and decreased cardiac output, all secondary to a confining pericardium. Chronic constrictive pericarditis is a disease that has multiple possible causes and is associated with variable clinical findings, depending on its severity. It develops insidiously, and in many cases, no etiology is ever determined. In some patients (approximately 10%), an antecedent acute pericarditis is present. Other cases of constriction are postulated to have been preceded by a subclinical, or occult, form of pericarditis. In many cases, particularly in developed countries, no antecedent diagnosis can be found. These cases are termed idiopathic. Reports by many authors indicate that a high percentage of idiopathic cases of constrictive pericarditis may be related to previously recognized or unrecognized viral pericarditis (see below). Tuberculosis is the leading cause of constrictive pericarditis in developing nations but represents only a minority of causes in the United States and other developed countries. Bacterial infections that lead to purulent pericarditis are also declining in frequency. In the past, purulent pericarditis associated with pneumococcal pneumonia was the most common presentation of a bacterial source. However, the widespread use of antibiotics has drastically changed the frequency and spectrum of purulent pericarditis such that the most common presentation now occurs following cardiac surgery. An increasing number of gram-positive organisms, including multiple resistant strains of staphylococci, may be isolated. Group A and B streptococci and gram-negative rods (eg, Pseudomonas species, Escherichia coli, and Klebsiella species) have also been documented. The long-term effects of thoracic and mediastinal radiation therapy (as used in the treatment of hematologic, breast, and other malignancies) are increasingly being realized. The common features of radiation-induced cardiac complications stem from microcirculation injury with endothelial damage, capillary rupture, and platelet adhesion. This sets up an inflammatory response, which may either resolve or organize to form adhesions between the visceral pericardium and the parietal pericardium. This cascade potentially leads to constriction. Any operative or invasive procedure in which the pericardium is opened, manipulated, or damaged may invoke an inflammatory response, leading to constrictive pericarditis (postpericardiotomy syndrome). The most common example is constrictive pericarditis in the setting of previous coronary artery bypass grafting (CABG) when only part of the pericardium is resected. Fungal infections are an uncommon source of constrictive pericarditis in patients who are immunocompetent. Nocardia species can be causative organisms, especially in endemic areas such as the Ohio Valley. Aspergillus, Candida, and Coccidioides species are important pathogens in patients infected with HIV and in other immunocompromised hosts. Malignant involvement may also manifest as pericardial effusion (with or without tamponade) or as an encased heart with thickening of both visceral and parietal layers, resulting in constrictive physiology. Although many types of neoplasms have been reported, breast and lung carcinomas and lymphomas are the metastatic malignancies most commonly associated with constrictive pericarditis. Other malignancies that involve the pericardium with relative frequency include melanoma and mesothelioma. Uremia with long-term hemodialysis can lead to constrictive pericarditis and is usually associated with a pericardial effusion. Autoimmune disorders that involve the pericardium are not unusual, typically manifesting as a small pericardial effusion or as an episode of acute pericarditis. Chronic pericardial involvement is less common but can occur in patients with rheumatoid arthritis, usually associated with the presence of subcutaneous nodules. Systemic lupus erythematosus (SLE) and scleroderma also may lead to constrictive pericarditis; in the latter case, the prognosis is poor. Procainamide and hydralazine have been reported to cause constrictive pericarditis through a drug-induced lupuslike syndrome. Methysergide therapy also has been implicated as a cause of constrictive pericarditis. Blunt and penetrating injuries to the chest wall have been reported to cause constrictive pericarditis, presumably through an inflammatory mechanism. Trauma-induced constrictive pericarditis is generally uncommon. Post-MI constrictive pericarditis has been reported. The patient typically has a history of Dressler syndrome or hemopericardium after thrombolytic therapy. Constrictive pericarditis after implantation of an epicardial pacemaker or automated implantable cardiac defibrillator is a rare but reported phenomenon. Mulibrey nanism is an autosomal recessive disorder characterized by multiple abnormalities, including dwarfism, constrictive pericarditis, abnormal fundi, and fibrous dysplasia of the long bones. In rare instances, constrictive pericarditis may occur after sclerotherapy for esophageal varices. Chylopericardium is a rare cause of constrictive pericarditis. As with many diseases that once were predominantly infectious in origin, the clinical spectrum of constrictive pericarditis has changed. Approximately 9% of patients with acute pericarditis from any cause go on to develop constrictive physiology. The true frequency is dependent on the incidence of the specific causes of pericarditis, but given that acute pericarditis is clinically diagnosed in only 1 in 1000 hospital admissions, the frequency of a diagnosis of constrictive pericarditis must be less than 1 in 10,000 admissions. In the developing world, infectious etiologies remain more prominent (tuberculosis has the highest total incidence). Although pediatric data are lacking for epidemiologic analysis, it is clear that the condition is rare in adults and even more rare in children. In all age groups, prevalence is increased among patients who are hospitalized and among patients who have undergone cardiac surgery. Cases have been reported in persons aged 8-70 years. Predilection is likely reflective of the underlying disease. Historical studies suggest a median age of 45 years, whereas more recent studies suggest a median age of 61 years (possibly reflecting ongoing demographic changes). There appears to be a male predominance, with some studies report a male-to-female ratio of 3:1. No racial predilection exists for this disorder. Because the disease is rare, prognostic data are relatively scant. Constrictive pericarditis is a potentially curable disease if diagnosed early, but it is potentially fatal if overlooked. One study showed postpericardiectomy survival rates of 71% and 52% at 5 and 10 years, respectively. The long-term prognosis with medical therapy alone is poor. Life expectancy is reduced in untreated children and in patients with relatively acute onset of symptoms. Long-term survival after pericardiectomy depends on the underlying cause. Of common causes, idiopathic constrictive pericarditis has the best prognosis (88% survival at 7 years), followed by constriction due to cardiac surgery (66% at 7 years). The worst postpericardiectomy prognosis occurs in postradiation constrictive pericarditis (27% survival at 7 years), probably as a reflection of confounding comorbidities. Occasionally, the etiology of the constriction may cause coincident myocardial dysfunction. With surgical treatment, the long-term outcomes of patients with constrictive pericarditis have been shown to be independently less favorable with advanced age, poor renal function, abnormal left ventricular systolic function, high pulmonary artery systolic pressure, lower serum sodium level, worsening NYHA classification, and, as noted above, radiation therapy as the cause of the constrictive pericarditis. [6, 9] The degree of pericardial calcification has shown no effect on survival. Failure of conventional medical therapy for CHF often follows an extensive diagnostic workup, leading to the final diagnosis of constrictive pericarditis. Decline in function is a result of decreased cardiac output (see the Cardiac Output calculator) with symptoms of CHF, along with morbidity stemming from chronic systemic venous congestion. Multisystem failure can develop into an end-stage of illness when global tissue hypoxia leads to worsening metabolic acidemia. Brockington GM, Zebede J, Pandian NG. Constrictive pericarditis. Cardiol Clin. 1990 Nov. 8(4):645-61. [Medline]. Shabetai R. Constrictive pericarditis. Shabetai R, ed. The Pericardium. New York, NY: Grune & Stratton; 1981. Hancock EW. On the elastic and rigid forms of constrictive pericarditis. Am Heart J. 1980 Dec. 100(6 Pt 1):917-23. [Medline]. Shabetai R. Pericardial Disease: etiology, pathophysiology, clinical recognition, and treatment. New York NY: Churchill Livingstone; 1995. 1024-35. Chen CA, Lin MT, Wu ET, et al. Clinical manifestations and outcomes of constrictive pericarditis in children. J Formos Med Assoc. 2005 Jun. 104(6):402-7. [Medline]. Bertog SC, Thambidorai SK, Parakh K, et al. Constrictive pericarditis: etiology and cause-specific survival after pericardiectomy. J Am Coll Cardiol. 2004 Apr 21. 43(8):1445-52. [Medline]. Imazio M, Brucato A, Maestroni S, et al. Risk of constrictive pericarditis after acute pericarditis. Circulation. 2011 Sep 13. 124(11):1270-5. [Medline]. Griffin BP, Topol EJ. Pericardial Disease. Manual of Cardiovascular Medicine. 2nd ed. Philadelphia, Pennsylvania: Lippincott Williams and Wilkins; 2004. 372-396. Kleynberg RL, Kleynberg VM, Kleynberg LM, Farahmandian D. Chronic constrictive pericarditis in association with end-stage renal disease. Int J Nephrol. 2011. 2011:469602. [Medline]. [Full Text]. Thompson JL, Burkhart HM, Dearani JA, Cetta F, Oh JK, Schaff HV. Pericardiectomy for pericarditis in the pediatric population. Ann Thorac Surg. 2009 Nov. 88(5):1546-50. [Medline]. Babuin L, Alegria JR, Oh JK, Nishimura RA, Jaffe AS. Brain natriuretic peptide levels in constrictive pericarditis and restrictive cardiomyopathy. J Am Coll Cardiol. 2006 Apr 4. 47(7):1489-91. [Medline]. Leya FS, Arab D, Joyal D, et al. The efficacy of brain natriuretic peptide levels in differentiating constrictive pericarditis from restrictive cardiomyopathy. J Am Coll Cardiol. 2005 Jun 7. 45(11):1900-2. [Medline]. Yazdani K, Maraj S, Amanullah AM. Differentiating constrictive pericarditis from restrictive cardiomyopathy. Rev Cardiovasc Med. 2005. 6(2):61-71. [Medline]. Welch TD, Ling LH, Espinosa RE, et al. Echocardiographic diagnosis of constrictive pericarditis: Mayo Clinic criteria. Circ Cardiovasc Imaging. 2014 May. 7(3):526-34. [Medline]. Sengupta PP, Mohan JC, Mehta V, Arora R, Khandheria BK, Pandian NG. Doppler tissue imaging improves assessment of abnormal interventricular septal and posterior wall motion in constrictive pericarditis. J Am Soc Echocardiogr. 2005 Mar. 18(3):226-30. [Medline]. Dal-Bianco JP, Sengupta PP, Mookadam F, Chandrasekaran K, Tajik AJ, Khandheria BK. Role of echocardiography in the diagnosis of constrictive pericarditis. J Am Soc Echocardiogr. 2009 Jan. 22(1):24-33; quiz 103-4. [Medline]. Appleton CP, Hatle LK, Popp RL. Cardiac tamponade and pericardial effusion: respiratory variation in transvalvular flow velocities studied by Doppler echocardiography. J Am Coll Cardiol. 1988 May. 11(5):1020-30. [Medline]. Hurrell DG, Nishimura RA, Higano ST, et al. Value of dynamic respiratory changes in left and right ventricular pressures for the diagnosis of constrictive pericarditis. Circulation. 1996 Jun 1. 93(11):2007-13. [Medline]. Sohn DW, Kim YJ, Kim HS, et al. Unique features of early diastolic mitral annulus velocity in constrictive pericarditis. J Am Soc Echocardiogr. 2004 Mar. 17(3):222-6. [Medline]. Veress G, Feng D, Oh JK. Echocardiography in pericardial diseases: new developments. Heart Fail Rev. 2012 Jul 1. [Medline]. Oh JK, Hatle LK, Seward JB, et al. Diagnostic role of Doppler echocardiography in constrictive pericarditis. J Am Coll Cardiol. 1994 Jan. 23(1):154-62. [Medline]. Zurick AO, Bolen MA, Kwon DH, Tan CD, Popovic ZB, Rajeswaran J, et al. Pericardial Delayed Hyperenhancement With CMR Imaging in Patients With Constrictive Pericarditis Undergoing Surgical Pericardiectomy A Case Series With Histopathological Correlation. JACC Cardiovasc Imaging. 2011 Nov. 4(11):1180-91. [Medline]. Amal L, Nawal D, Abdellah Z, Anis S, Fouad Amal W, Abdellatif B, et al. Use of magnetic resonance imaging in assessment of constrictive pericarditis: a Moroccan center experience. Int Arch Med. 2011 Oct 19. 4(1):36. [Medline]. Ariyarajah V, Jassal DS, Kirkpatrick I, Kwong RY. The utility of cardiovascular magnetic resonance in constrictive pericardial disease. Cardiol Rev. 2009 Mar-Apr. 17(2):77-82. [Medline]. Imazio M, Brucato A, Mayosi BM, et al. Medical therapy of pericardial diseases: part II: Noninfectious pericarditis, pericardial effusion and constrictive pericarditis. J Cardiovasc Med (Hagerstown). 2010 Nov. 11(11):785-94. [Medline]. Feng D, Glockner J, Kim K, et al. Cardiac magnetic resonance imaging pericardial late gadolinium enhancement and elevated inflammatory markers can predict the reversibility of constrictive pericarditis after antiinflammatory medical therapy: a pilot study. Circulation. 2011 Oct 25. 124(17):1830-7. [Medline]. Amaki M, Savino J, Ain DL, et al. Diagnostic concordance of echocardiography and cardiac magnetic resonance-based tissue tracking for differentiating constrictive pericarditis from restrictive cardiomyopathy. Circ Cardiovasc Imaging. 2014 Sep. 7(5):819-27. [Medline]. Hatle LK, Appleton CP, Popp RL. Differentiation of constrictive pericarditis and restrictive cardiomyopathy by Doppler echocardiography. Circulation. 1989 Feb. 79(2):357-70. [Medline]. Talreja DR, Nishimura RA, Oh JK, Holmes DR. Constrictive pericarditis in the modern era: novel criteria for diagnosis in the cardiac catheterization laboratory. J Am Coll Cardiol. 2008 Jan 22. 51(3):315-9. [Medline]. Talreja DR, Edwards WD, Danielson GK, et al. Constrictive pericarditis in 26 patients with histologically normal pericardial thickness. Circulation. 2003 Oct 14. 108(15):1852-7. [Medline]. Imazio M, Antonio B, Roberto C, Ferrua S, Belli R, Maestroni S, et al. Colchicine treatment for recurrent pericarditis (CORP): a randomized trial. Ann Intern Med. 2011 Oct 4. 155(7):I28. [Medline]. Tuna IC, Danielson GK. Surgical management of pericardial diseases. Cardiol Clin. 1990 Nov. 8(4):683-96. [Medline]. Ling LH, Oh JK, Schaff HV, et al. Constrictive pericarditis in the modern era: evolving clinical spectrum and impact on outcome after pericardiectomy. Circulation. 1999 Sep 28. 100(13):1380-6. [Medline]. [Guideline] Maisch B, Seferovic PM, Ristic AD, Erbel R, Rienmuller R, Adler Y, et al. Guidelines on the diagnosis and management of pericardial diseases. European Society of Cardiology. 2004. Clare GC, Troughton RW. Management of constrictive pericarditis in the 21st century. Curr Treat Options Cardiovasc Med. 2007 Dec. 9(6):436-42. [Medline]. Constrictive pericarditis. Anteroposterior and lateral chest radiograph from a patient with tuberculous constrictive pericarditis (arrows denote marked pericardial calcification). Right atrial pressure tracing showing marked y descents (arrows) in a patient with constrictive pericarditis. Simultaneous right and left ventricular pressure tracings showing diastolic equalization of pressures in both ventricles in a patient with constrictive pericarditis. Acknowledgments for this work include support by the Office of Research and Development, Medical Research Service, Ralph H. Johnson Department of Veterans Affairs Medical Center, and the Gazes Cardiac Research Institute, Department of Medicine, Medical University of South Carolina, Charleston, South Carolina. Fast Five Quiz: Do You Know Enough About Rheumatoid Arthritis? Lead Perforation Extending Beyond the Pericardium: Can We Treat It Percutaneously?